Even if you’re a beginner or have limited outdoor space, Honey Bee City’s beekeeping starter kit can help you join the urban beekeeping movement. 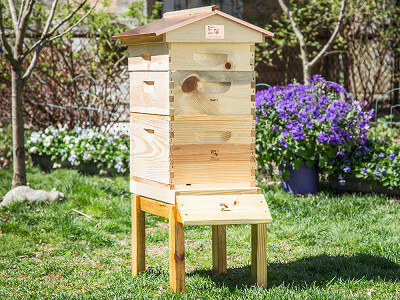 This modular beehive is Made in the USA and easy to assemble—stack it up and the bees will seal the structure with propolis, a byproduct of their honey making. There’s a clear panel to peek inside, and the copper roof is a nice design element that also protects the hive. Bees help produce about one third of our food through their pollinating efforts, so having them around is vital. For the past few years, hives have been disappearing at an alarming rate, in part because of Colony Collapse Disorder, when worker bees disappear and the colony dies out. “Beekeeper Rick” Cousins created this simplified system after moving to an urban neighborhood, where his commercial beekeeping supplies were oversized. While helping out the bees, you’ll also reap the benefits—like nutrient-rich honey and beeswax. Before you get started, check your local laws about hive regulations and registration. You’ll also need to “hire” (i.e. buy) your buzzing workers, and local bees are best. Contact a beekeeping organization in your area and they’ll be happy to help. Hello Grommet fans! I’m "Beekeeper Rick" Cousins, Co-Founder & Apiarist of the Honey Bee City Urban Beekeeping Kit. I am honored and excited to have our invention featured as today’s Grommet. As an avid urban beekeeper, I want to get you involved in saving the bees by bringing beekeeping to urban areas where they can prosper. We specifically created Honey Bee City for urban hobbyists who want to pollinate gardens, produce honey, beeswax for crafts, and help “God’s Little Flying Angels." This is an exciting and worthy undertaking! When I saw the bee house, I assumed I would set it up in the backyard (I have bee and butterfly friendly plantings), they would move in, and that would be that. It seems a bit more complicated. 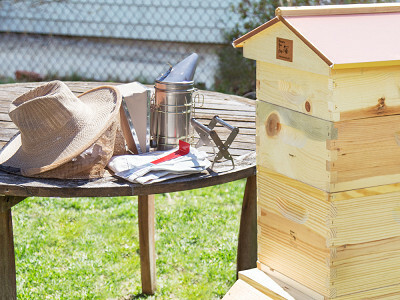 Could you go through the steps you would need to set up the apiary and maintain it? It is very easy to do, first when you get your package, after you remove the shipping box. The whole bee hive comes assembled and ready to use. Just cut the bands with scissors. Then move the hive to your location. The only piece you won't use right now is the view cover. Put that aside. everything else stays. 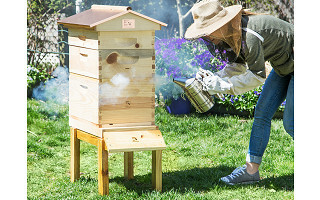 If your using a nuc or a package of bees in, remove the lid and top feeder and honey super and queen excluder put aside. 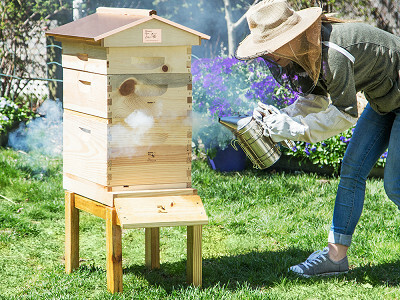 Remove 5 frames from the middle of the brood box, insert your nuc frames, or shake your package of bees into the deeper. Once your bees are in the deeper, re assemble the hive and fill the top feeder with sugar water. Don't touch the hive for 4 days. Then re inspect the hive and make sure everything is all right. Keep feeding your bees until they stop taking the sugar water. Once they start bringing in nectar and pollen, they will be self sufficient. You'll notice that they haven't touched their sugar water. When that day comes, remove the top feeder. If you have any questions I'm always available to help. I always recommend that you join a local bee club. It's always good to work with a mentor to help you with your new endeavor. Hope this helps. This is a great concept and kit for the dwelling, but where does one secure the bees? @Anne you can normally capture swarms right around this time of year, or buy "package bees" (approx 3,000 bees plus a queen, comes in the mail for ~$150-200), or a "nuc" (five frames of brood and bees, with laying queen) for ~$125-150. You'll have to pick that up from a local beekeeper, most likely. What city are you in? I can get you a list of beekeeping associations in your area, to help you with your bees. For the new beekeepers questioning in here, you'll likely want to join a local club. These are growing everywhere and usually very helpful! A good starter place to find one in your area is Bees on the Net or just google for "local beekeeping clubs or associations". I'm sure Rick can help you with some general questions, but your local club will have more information and resources relevant to your area. @Andrew Sorry, not a new invention! Bee hives like this have been around for a long time. I recently started and found valuable information online. Also found a much lower cost for hives and supplies. Darn, this looks vaguely familiar to yours? Anyway, nice try but good getting the word out on bee keeping. Steve your right Brushy mountains beginners 8 frame is cheaper, but, they only offer a entrance feeder, we offer the top feeder which holds more sugar water. and we offer the queen excluder and the plastic view cover, for viewing and cutting down on burr comb. Also ours is clear stained to preserve the wood. 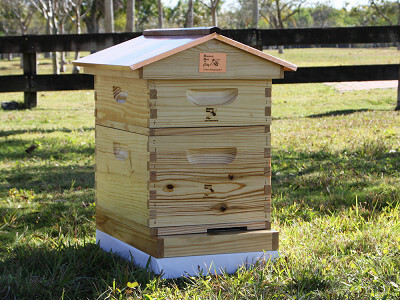 Yes it's an 8 frame hive with a lot more class and more options. Hope you like it. I forgot our hive also comes with the hive stand. Which keeps the hive off the ground and away from water damage. And is easier to work with. @Steve I don't think Andrew was doing anything other than providing information to new or wannabe bee keepers. Why respond that "it's not a new invention", "this looks vaguely familiar to you", and "nice try"? I really don't understand why you would be so snarky to someone who is just trying to be helpful - he wasn't trying to promote his own product or organization or anything! I'm right there with you, Victoria. And thank you, Rick, for helping explain the differences. One more important difference, Honey Bee City is handcrafted in the USA. Rick is collecting tags with this great product. @Victoria Thanks, and you're correct. I really have no vested interest here except to see more beekeepers in our midst, and I to nudge appreciation for what Rick's trying to do here. Good luck to you! @Steve It's all good, not trying to promote anything except community. @Rick I can confirm that entrance feeders tend to leak as well as holding less total sugar water, especially when they're sitting directly in the Florida sunshine! Thanks again for promoting this to the general public, and best of luck! Yes your correct, once I retired I started beekeeping. I love it, my kids not so much, but they will help me in processing the honey. My youngest is okay with the bees. It's nice to be outside watching mother nature and enjoying my bees. But you do have to take care of them. I got some nice honey pics I'll show you later. anyone new to beekeeping will want to join a local club and/or take an instruction course at your local community college for many reasons. I cannot stress this enough. Very True, and very important, for knowledge reasons and for health reasons of the bees. My first mentor was Libby from charlotte. A great person with a wealth of knowledge about bees. I also took the local beekeeping course they offered. A must for all future beekeepers. The more informed you are the better you can care for your bees. We are very happy to be working with the Grommet in this endeavor to help save the bees. This is very cool. I have a few questions, sorry for asking all at once. About how many bees will a hive of this size support? How much honey is produced by a typical hive of this size per year? Do you harvest it more than once a year? What is a safe distance for people moving around in the yard to stay from the hive without provoking the bees? This hive will host a colony of bees usually around 60,000 -80,000 bees. Depending where you live determines how much honey your hive will produce. In Florida we have 2 seasons of honey extraction. In North Carolina we have one. Remember the first year the bees need 40-60 lbs of honey to get thru the winter. Wherever you put the bees just remember don't walk in front of hive. It's there flight path. Bees don't like us standing in front of the hive when they are trying to fly out. My bees are about 20 feet out my backdoor, facing east in full sun. My friend has one bee hive right in the backyard facing his garden. So when he works the garden the bees are there. A little to close for me, but it works for him. Thanks for your response. I'm in central New York, near Syracuse. I knew that you would have to leave some portion of the honey for the bees but I had no idea so many could live in a colony of that size or that they would require 40 - 60 pounds of honey to survive. I was thinking a colony this size would produce maybe 20 pounds of honey total for us and the bees. Boy was I off on that one. They really are busy! Does the amount of honey they need change in subsequent years or are you just saying to basically leave the honey alone for the first year while the bees establish their colony? The first few months you have the feed the bees sugar water. Once flowers start blooming and they start making their on honey. You can stop feeding them. Then the bees start to store honey so they can get thru the winter. In New York the bees would put away around 60 lbs of honey. So the first year you might get 10 lbs of honey for yourself. But next year that should increase to 20-40 lbs. Whatever honey you don't pull out of your honey supers, the bees will move down into the brood supers for winter food. hope this helps, ask me anytime you have questions. That's great! Thanks again Rick! Rick, thank you for these informative comments. We lost our local 90+ year old beekeeper a couple of years ago. So much wisdom and knowledge gone. I am concerned about the plight of the bees. (What would mankind do without the magnificent bees?) I want to learn more what to do to help them. I also know the health benefits of the products that bees produce. I hope to sign up for introductory classes to beekeeping just to educate myself. Ramona, what state are you in? It's well worth it and really fun.